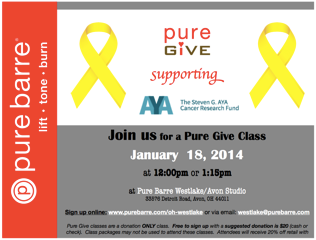 Home / Archive by category "PURE BARRE"
Take A BITE out of AYA CANCER!!! Our 5th Annual fundraiser will take place this Saturday, January 25th, 2014. Tickets are being sold at a rapid pace, so if you are thinking about attending may I suggest you visit our website (www.fightconquercure.org) or email me (angie@fightconquercure.com) to make your purchase. Our wonderful committee has been working diligently to make this event the best ever!!! Pure Barre Workout Gift Basket! Spa Items From Charles Scott and Fusions Salons! Get Fit with Jeremy Dancy of Official Fitness Pro! Loge Seating for Cleveland Sporting Events! What a great way to help us Fight Conquer Cure Cancer!!! Proceeds will go towards the Steven G AYA Cancer Research Fund! Support AYA Cancer Research, Education and Advocacy and GET INTO SHAPE!!! Also, Steven G will be joining us at 1:00 pm to thank all of you for supporting our cause! AYA CANCER RESEARCH, AWARENESS AND EDUCATION. BUT LORI SUGGESTS A DONATION OF $20 AT THE DOOR. WE WILL NOT REST UNTIL THERE IS CURE!! !